There will be a couple of firsts tomorrow night at “Lion Fight 8” – Yodsanklai Fairtex (Pictured) will be making his long-awaited debut on American soil and the card marks the first ever live nationally televised Muay Thai event in the history of the sport. 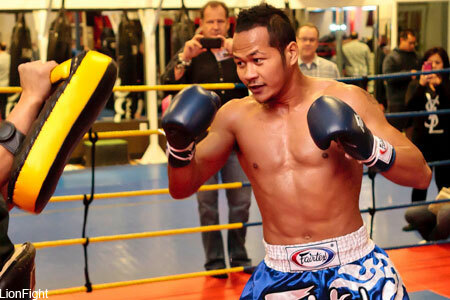 Fairtex takes on Muay Thai Champion Gregory Choplinin Friday’s featured attraction. WBC Muay Thai Champion and undefeated female fighter Tiffany Van Soest faces Alexis Rufus in the co-main event. The Joint in the Hard Rock Hotel & Casino in Las Vegas hosts the festivities. The main card will be presented live on AXS TV starting at 10PM ET. Tickets for Lion Fight 8 are on sale now through the Hard Rock Hotel & Casino box office and Ticketmaster.com.